Hopefully you have already read my history of digital photography home page. It starts with a history of photography itself which is an interesting introduction to the history of digital photography. Without the early photographers, we wouldn't have the cameras that we have today – so we owe them a little look! On this page you will find the significant developments of consumer digital cameras. To begin with, there's the first consumer digital camera - Sony's Mavica. Then the improvements in sensors that have enabled prints to be made from digital cameras. An interesting evolution is Foveon's image sensor that takes a new approach to digital camera sensors. Finally the first affordable digital SLR from Canon. 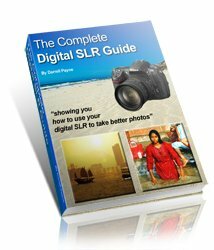 digital-photography-tips.net is updated regularly. To learn out about the updates as they happen subscribe to the digital photography blog, and this site's RSS feed. Following the exploits of digital cameras in space, the history of digital photography moves back to Earth here. This page covers the history of consumer digital cameras – the ones we are all familiar with. A new era in photography began on August 25, 1981 when Sony unveiled a prototype of the company's first still video camera, the Mavica (Magnetic Video Camera). It recorded analog images on two-inch floppy disks (memory sticks hadn't been invented back then!) and played them back on a TV set or Video monitor. NB: The ‘Mavica' name comes from Magnetic video camera. 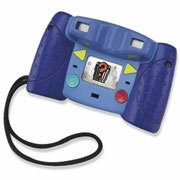 The Mavica was not a digital camera, but a still analog version of the video cameras of the time. The difference between still video images and digital images is a bit like the difference between analog vinyl LP records and today's digital music. The analog version is a physical representation of music; while the digital version is an encoding of the music. Various companies produced still video cameras throughout the ‘80s. In 1988 Fuji marketed the first consumer all –digital camera, the DS-1P. In 1990 Dycam marketed the first consumer digital camera sold in the United States, the Dycam Model 1 (also sold by Logitech as the Fotoman). Storing images on floppy disks was an important development because it meant that, the number of photographs that could be stored was, effectively, limitless. If you filled the floppy disk up with photographs you just inserted a new blank disc. The capacity of these blank disks was less than 1MB. Back in 1981, and with a Mavica, you could store about 25 photographs on one disk. NB: A high quality photograph from today's digital cameras is easily 1mb. At best you'd only be able to store one photograph on a floppy disk! Thankfully, the memory card has been invented since then, capable of storing hundreds of digital photos. From this point forward the history of digital photography is one of improvement rather than new development, with the possible exception of the Foveon X3 image sensor. The improvements of digital imaging sensors is an important part of the history of digital photography. In 1981 Sony's Mavica, with 0.3 megapixels, was never going to be enough for good quality digital photography. Viewing photographs on screen was possible, but prints were lousy! To get good quality photographic prints the resolution had to be improved. To get a good quality snapshot print you need to have at least 2 megapixels, and ideally 3MP. (have a look at my table showing how many megapixels are needed for good quality digital photography). So, although Sony were first through the door of the digital photography party, their first digital camera was limited in both its use and popularity. For consumers, the history of digital photography springs to life with the introduction of 2 and 3 megapixel cameras. Nikon were first past the post on this one, introducing two 2 megapixel cameras at the start of 1999. One camera had a zoom lens (the "Coolpix 950", shown here), the other ("Coolpix 700") had a fixed focal length. NB: Kodak had already introduced "professional" digital cameras with 6 megapixels before 1999, but their camera could hardly be considered one for the consumer – it weighed 3.75 pounds and had all the style of a house-brick! It's not just about the size of your megapixels, it's what you do with them! In 2002 Foveon started producing a new image sensor. The reason why this is an advance is that up until this point digital camera sensors have recorded only one type of light at a given location. Individual ‘photosites' (these are the pixels of the sensor) collect information about either red or green or blue light. The development of digital cameras continues from this point with the cameras steadily improving all the time. They now have even more megapixels and cost even less. The next significant step in the history of digital photography is the introduction of the digital SLR. Digital SLRs had been available up until now, but they were strictly for the professionals. Costly and heavy they were never going to become mainstream. Canon changed all that in August of 2003. In the summer of 2003 Britain was recording its hottest day ever (101.3 degrees at Faversham in Kent) and the lights went out on 50 million North Americans – the result of a massive power outage. Canon was launching the Digital Rebel. This camera is of huge significance in the history of digital photography because it was the first affordable digital SLR. Suddenly keen amateurs with film SLRs, who had built up a lens collection, could just take their lenses from their old film cameras and attach them to the new Canon. The camera also offered fast response times unlike the compact cameras up until this point. What of the future history of digital photography . . . The improvements in film photography led to smaller and better cameras; the improvements made throughout the history of digital photography have led to more pixels, smaller cameras, lower costs and greater memory capacity. Today it's possible to buy a reasonable 3 megapixel camera for under £100. Technology never stands still though. Few would have predicted the stunning growth of digital photography, even ten years ago. And now digital cameras outsell film. Some manufacturers have already pulled out of the film market completely. So, with film cameras going the way of the dodo, perhaps the history of digital photography truly starts now? UPDATED: June 2015. After checking the latest cameras and prices available online, it seems things have moved on ... again! 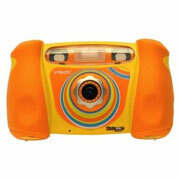 3 megapixel cameras just don't seem to exist, unless they are those colourful and rugged digital cameras aimed at kids. The image resolution for a "bottom of the range" digital camera is now upwards of the 6 megapixel mark. Were you to buy one of these you would only need to part with £40 (around US$70). An interesting development is now the growth of digital cameras on smartphones. The sensors on these pack in more and more megapixels (more than a few have over 12 million pixels on board). Added to that is the software enhancements found on smartphones. You can do a panorama just by moving the phone in an arc, you can do HDR photography without trying, and you can make multiplicity photos in an instant. As a final note, what's my prediction on the future history of digital photography? Well . . . 3D digital photography? Without the funny glasses! Surely it's possible? What was the first digital camera you owned? Spend a moment to tell us about it. Do you have a picture of your first digital camera? Possibly not. But if you do, great! Click the button and find it on your computer. Then select it.